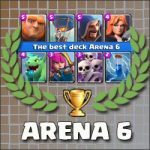 Arena 6 good deck with Giant Skeleton and Witch | Clash Royale fan-site! 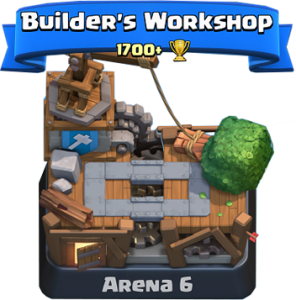 “Builder’s Workshop” is the sixth Arena in Clash Royale (if to not count the Training Camp). 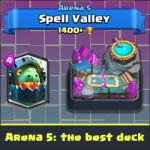 On one of my accounts, I managed to pass through this arena and promoted to the 7th one (“Royal Arena”) as a 1st level player with all 1st level cards in my deck! In this post, I will share a deck with Giant Skeleton, Witch and the Goblin Barrel, which works pretty good at Arena 6 and helped me to overcome it. Note: I do not upgrade my cards and do not raise my player’s level, in order to better assess the quality and capabilities of the formed battle deck. Giant Skeleton. A universal card that has very decent characteristics even when is underleveled. The key factor in favor of choosing Giant Skeleton was his powerful bomb, which explodes after skeleton death. This bomb is a very useful defensive tool and very often saves from opponent’s counterattacks. Goblin Barrel. The main attacking card in the deck or the main winning condition, if to say in other words… In case of proper use, Goblin Barrel turns into very powerful tool to destroy enemy towers. Three fast, armed with knives goblins are able to cause very serious damage to tower for the few seconds only. The main thing is to choose proper time for its deploying (see below). Skeleton Army. Defensive card. It’s very good counter for such threatens as PEKKA, Prince, Golem, Giant, etc. Baby Dragon and Witch. Two universal cards, which are useful both in attack (to cover Giant Skeleton) and in defense. Both of them are area damage troops (can deal area damage). A few tips on how to play deck with Giant Skeleton on the 6th Arena. Proper use of the Goblin Barrel is key to the victory. The most important thing is to choose proper moment for its deployment. As for me, such moment is when opponent’s tower is distracted by other troops. For example, deploy Giant Skeleton and Witch… and when they are crossing the bridge – launch barrel directly to the enemy tower. In such case, princess on the tower will shoot in Skeleton and that will allow to goblins attack tower relatively freely. 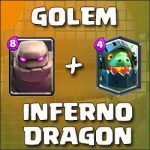 If you have opened Inferno Dragon, you can change Inferno Tower for some other card. But I strongly recommend to have at least one building in a deck. Therefore, I think that Goblin Hut would be the best choice for exchanging. Giant Skeleton is a very good defending tool… Or correctly saying his bomb is… So use benefits from it and save elixir for own attack. 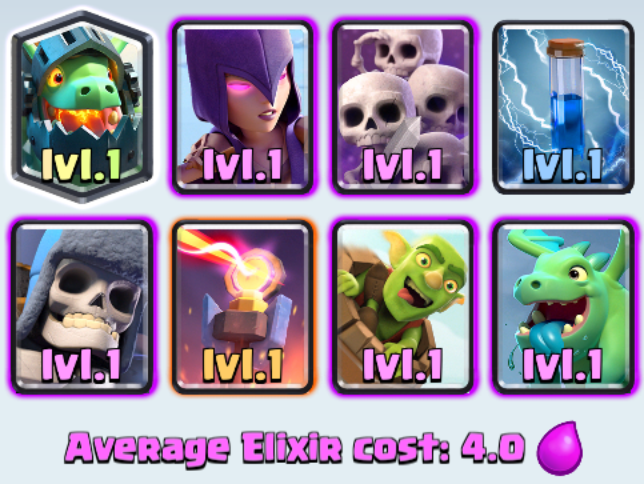 What I mean… I mean that in case, when opponent attacks your tower by group of troops with low or middle hitpoints level – deploying Giant Skeleton against all of them would be more than enough! His bomb will destroy all such group and saves some elixir for own attack. Good luck and see you at Clash Royale arenas! 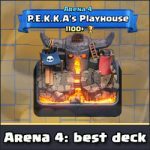 Tagged Arena 6, Decks, Giant Skeleton, Inferno Dragon. 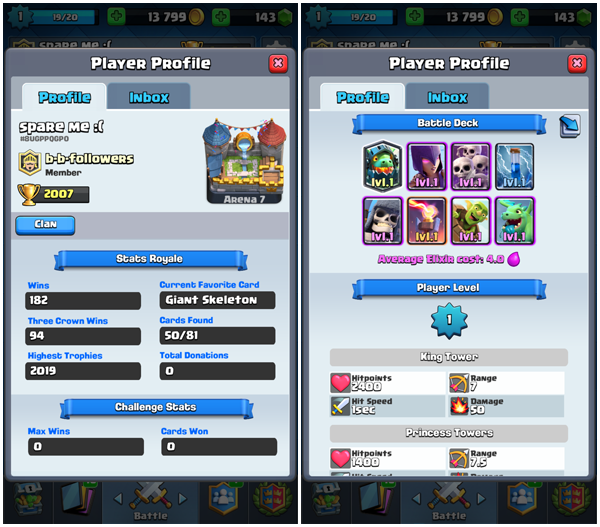 « 2v2 challenge: win deck and tips.